Roasted Tomato Soup is definitely a great start for the soup season! “Is there a special season for making soup?” you might ask. I think here it starts in October and lasts until May, right before it gets hot. Nobody craves for a heartwarming soup when there is already a boiling weather outside, right? It’s getting cooler here these days, so I thought it’s high time for a tasty, flavorful roasted tomato soup! So why is it the best time for roasted tomato soup now? We can see the last tasty egg-shaped tomatoes at the market these days and the soup becomes divine with these Fall tomatoes since they are still keeping their flavor and color unlike those tasteless winter tomatoes. Tomato soup is one of my favorite soups and I make it quite often in winter, but not with roasted tomatoes. I use either homemade tomato paste or preserved tomatoes to make the soup more flavorful and colorful when we can’t find delicious tomatoes in cold weather just like in this Tomato Soup. Roasted tomato soup makes a great difference since the tomatoes absorb the onion and garlic flavors when roasting in oven. To have that amazing flavor combination, just slice the tomatoes and roast them in oven with onion and garlic on a baking sheet. You can even add red bell pepper at this step, but I didn’t use it in this soup since we didn’t have any. If you are using egg-shaped plum tomatoes, you don’t need to add tomato paste, they are already tasty and red enough. The ones in the pictures here are not plum tomatoes since I used them all in the soup! These would work fine too, but plum tomatoes are the best for this soup. Tomato soup is mostly served with kasar cheese topping in Turkey, but I’d love to have it with croutons and dried mint this time. If you love it with cheese, make sure that it’s a kind of melting cheese. 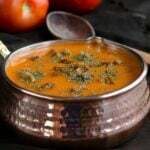 A flavorful tomato soup with roasted tomatoes, onion and garlic. Place sliced tomatoes, onion and garlic cloves on it. Roast them until tender, about 35 minutes. Melt butter in a pot and add flour, saute it continually mixing for a few minutes until its color changes. Transfer roasted vegetables into the pot and stir. Pour water and stir until it boils. Puree the soup with a blender until smooth and bring back to heat. Add salt and milk and let it boil until it reaches the right consistency. To make croutons, fry bread crumbs in a pan with butter. When you say “roast”, what temperature are you setting the oven too? Hi Dan, as stated in the recipe, heat the oven to 180C (350F). Hi Robin, yes this soup freezes well. I just love your copper cookwear pieces and I love tomato soup! I must give this one a try.